If you’re a regular reader of this blog, you’re going to start noticing very quickly that I am a little obsessed with matcha right now. Last month, I brought you a simple recipe for a Copycat Starbucks Iced Matcha Latte. This month, I’m bringing you a copycat recipe for a Starbucks drink that is only available in the Asian market, the Matcha Espresso Fusion. 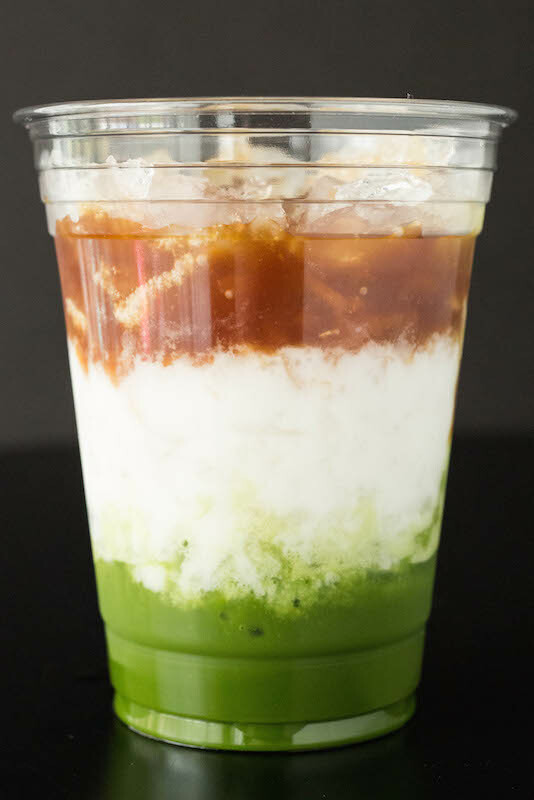 Layered matcha drinks are all the rage here in LA and on my Instagram feed right now. I’ve fallen in love and have started making my own. When I saw a photo of Starbuck’s Matcha Espresso Fusion, I knew I had to try it. I was a little intimidated at first, but it is actually super easy to make. I like to mix the bottom matcha layer with vanilla bean syrup. You could also use a little bit of sugar or another sweetener instead. For the middle layer, I generally use coconut milk. However, any milk you’d like to use will work. The top layer is a shot of espresso. 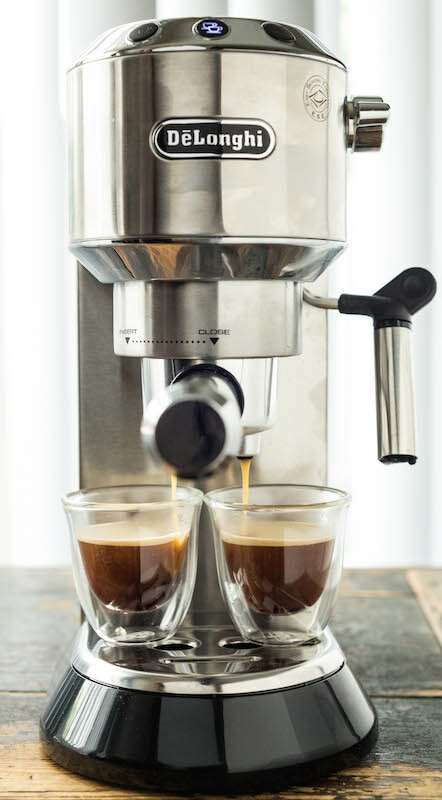 I love using my De’Longhi machine to make espresso because it’s just so easy! My favorite beans to use would be Intelligentsia Black Cat Espresso. 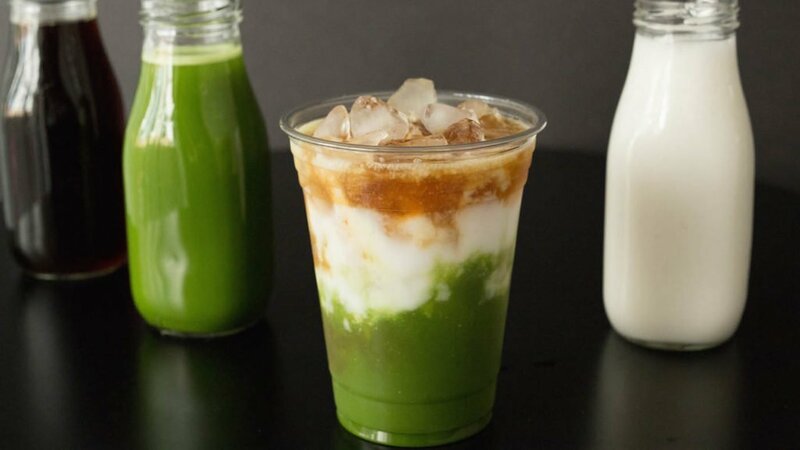 Now you know how to make your own Starbucks Matcha Espresso Fusion at home! Don’t forget to take a photo and put it on the ‘gram. Let those likes pour in! If you do, please tag us and use #cookingwithjanica. We’d love to see it! Check out the video below to watch me a Matcha Espresso Fusion drink. Add Matcha Powder to 1/3 cup warm water. Mix thoroughly with a spoon or milk frother. Add matcha mixture to the bottom of a cup. Add 1/3 cup ice. Slowly pour the milk over the top of the ice. Add 1/3 cup ice. Slowly pour the espresso over the top of the ice. Add vanilla bean syrup or another sweetener of choice. This looks perfect for St. Patrick’s Day! This would be a great morning jolt of caffeine or a nice dessert too! Thanks for sharing! I was just looking at matcha in the store, and thinking I really need to get some! I admit, I was thinking of more traditional uses, but this is intriguing… And layered drinks are so much fun. Starbucks is a favorite! I saw a matcha drink on their menu the other day, and almost ordered it. Wish I would have, because if it was this one I totally missed out! This looks really good! My youngest loves this drink.I am so happy to make it at home and have a great drink and save money too! This looks so good! I’m going to have to pick up some matcha powder so I can make this. I’ve been in the habit of having an espresso in the mornings and a matcha in the afternoons, but I never thought to combine them! This is definitely happening tomorrow. This sounds delicious! I love this drink from Starbucks. Would love to make it at home! I’m pretty convinced that I need an espresso machine now! This looks fantastic – and Matcha is so good! Wow! This sounds so delicious! Never thought to combine them! I have been in the habit of having an espresso in the mornings and a mocha in the afternoons! So would love to mix up them together. I am gonna definitely try this out tomorrow. I just made this and it’s a perfect solution to my indomitable sweet tooth, without being too sweet, thanks to the espresso. Thanks for this! !